Most nurses know that Florence Nightingale was the founder of modern nursing. She lived from 1820-1910 and we celebrate her birthday during Nurses Week every year around the second week of May. Nursing was viewed as menial lowly labor and not an honorable profession. She went against societal norms and her upper class parent’s wishes for her to marry respectably. Instead she pursued nurses training and within a few years led a cadre of 36 nurses to serve in the Crimean War. Never before had nurses been deployed to a battlefield hospital. Florence believed she had a calling and would not be deterred. “The world is put back by the death of every one who has to sacrifice the development of his or her peculiar gifts to conventionality. Were there none who were discontented with what they have, the world would never reach anything better” . Throughout her life, Florence was focused and hard-working. During the Crimean war, she worked 20 hour days in vile conditions to nurse the men. When Florence and her team arrived in camp, men lay in their own excrement on stretchers. The air was foul and the linens were non-existent or filthy. Bugs and rodents ran freely through the camp. Soiled dressings covered draining wounds. More men died of infection than battle injuries. Florence rolled up her sleeves and scrubbed every surface. She enlisted able patients and put them to work with buckets of soapy water. She insisted on attractive appearing meals, clean linen, and fresh air. “If a patient is cold, if a patient is feverish, if he is sick after taking food, if he is faint, if he has a bed-sore, it is generally the fault not of the disease, but of the nursing” Florence Nightingale 1820-1910. After long, exhausting days, she rounded on patients at late night holding her lamp high and encouraging the men with her compassion and nurturing. The men dubbed her the “Lady with the Lamp” and to them, she was an angel. Florence Nightingale helped to abolish harsh prostitution laws against women. In 1864, the Contagious Diseases Act was passed in Britain. Under this law prostitutes could be arrested, taken in, and checked for venereal disease. Prostitutes found to be infected were locked in a hospital until cured. This was intended to protect men from disease. Like many women at the time, Florence saw this as discriminatory to women. She fought to change the law and advocated for significant health reforms for all of British Society. The war took a tremendous toll on her health. Florence had very poor health at a young age (in her thirties) and suffered from fevers and various complaints that defied diagnosis. Nightingale had contracted the bacterial infection brucellosis, also known as Crimean fever. Her symptoms included insomnia, palpitations and headaches. They were severe enough that she was bedridden for 6 years. She was said to suffer from anxiety and some suggest her ailments were psychosomatic. Most people, however, choose to look at her accomplishments and the advances she made for nursing and not her illnesses. Even from her sick bed, she authored books and made plans to open a school for nursing. “I attribute my success to this - I never gave or took any excuse.” Florence Nightingale 1820-1910. Florence was a talented writer, who wrote passionately about her beliefs. She wrote in a manner that everyone could easily understand with a knack for plain speaking. She also was a statistician and recorded her observations and incidence of infections and death. In 1860 she established St. Thomas' Hospital and founded the first secular nursing school, the Nightingale Training School for Nurses. A revered hero of her time, she died on August 13, 1910, in London. Many nurses take the Nightingale Pledge as part of their pinning ceremony. More than a century after her death, Florence remains an example to modern day nurses. The spirit of Florence lives on in nurses everywhere who carry on her work. Thanks in large to Florence, we are a respected profession. 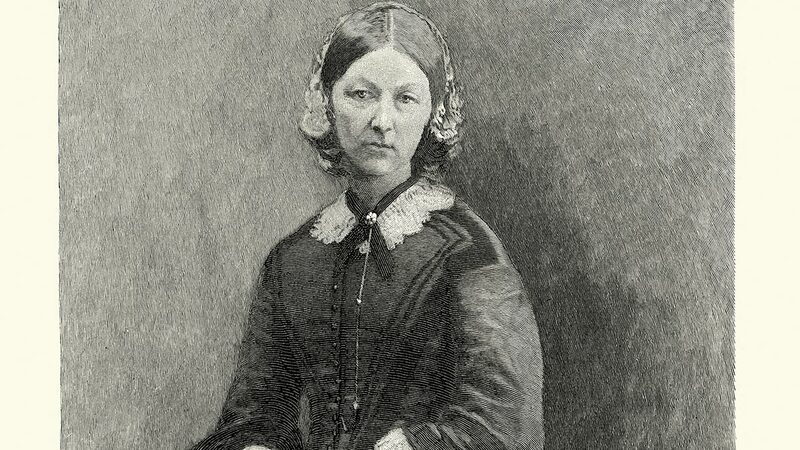 Nurses Week is a time to pay homage to our founder and the The First Nurse of Nursing, Florence Nightingale.